That sounds really nice, Lee. Wish I were a Denver Brokie at times like this...would you be willing to share the original recipe around here somewhere? And Matt, I too am curious about chorizo dessert?! 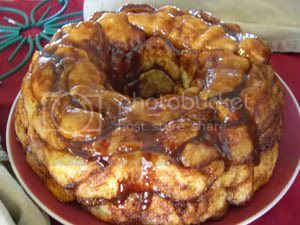 You all have never heard of monkey bread before?!! 3. Arrange pieces in the bottom of the greased pan. Continue layering until all the biscuit pieces are coated and in the pan. If you are using raisins, place them among the biscuit pieces as you are layering. That sounds really yummy, David! Thanks for the recipe and pictures! Planned for dinner tonight: Macaroni and cheese and a fried bologna sandwich! Is this some subtle way of telling us you have a new Italian/Scottish boyfriend and a hot date planned? No, it's a direct way of telling you that I'm having macaroni and cheese and a fried bologna sandwich for dinner. And bologna doesn't just come from Bologna. Where did the Scottish come from? I'm concocting a pork and hominy stew for breakfast, which I'll be wrapping in a tortilla. I had a tall mocha for dinner last nite, which is why I'm having a robust breakfast. Dinner will be lasagna and steak; hopefully I will get a smalll crowd of Brokies to eat it with me!